Yo, that looks like the bargain tie counter at Penney's. Kevin, you have clearly come up with another idea for rewarding merchants who have great Merchantcircle listing or sharing Merchantcircle with other merchants. 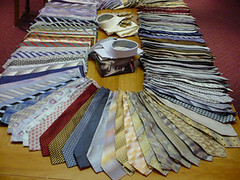 They all get one of your ties since you don't need them any more. I got a smile out of your tieless atire! I am in the business of making window dressings and someone asked me to make something from some beautiful silk ties that she wanted to remember her guy with, so I made her a cornice type valance with the ties...how useful is that...it fits over a sliding glass door...and I'm sure gets a lot of comments! 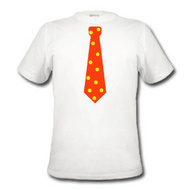 So send me those ties.